When Grease was all the rage in 1978, everyone was trying to profit from that success. It led to some unlikely products, such as this one. 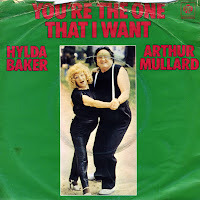 Ex-boxer and comedy actor Arthur Mullard (born September 19, 1910) teamed up with comedy actress Hylda Baker (born February 4, 1905) to record this substandard cover of 'You're the one that I want'. It sounds a bit like the Dutch antisocial Tokkie family doing karaoke. The single reached number 22 in the UK singles chart, but failed to climb further due to a disastrous appearance on the chart show Top of the Pops. The couple fluffed the lyrics and seemed utterly confused as to what was happening. (You can see the performance here). The B-side is a Eurovision cover: Brotherhood of Man's 'Save your kisses for me' as performed by this bizarre couple.